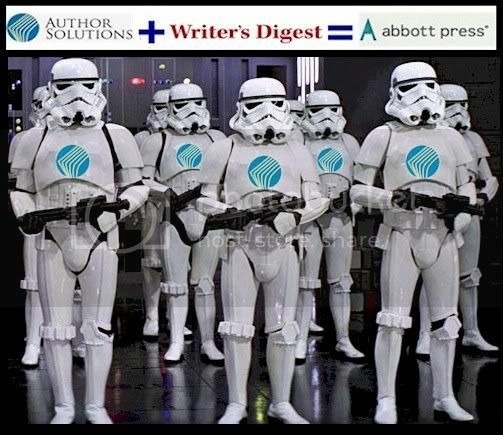 Is Author Solutions emulating Emperor Palpatine's Stormtroopers from Star Wars, or the "Resistance is Futile" Borg from Star Trek? Author Solutions, Inc. (ASI) is a massive pay-to-publish empire which has grown by acquiring and combining such former competitors as AuthorHouse, iUniverse, Trafford, Wordclay and Xlibris. Last year ASI started a Spanish-language division called Palibrio. ASI also operates the self-publishing businesses for traditional publishers Harlequin, Thomas Nelson and Hay House. Those alliances pissed off many people when they were announced. The latest announcement from ASI is even more disturbing. The press release they sent out on Saturday is below the following parenthetical paragraph. New York City (PRWEB) January 22, 2011 -- Writer's Digest, the oldest and most respected [NOT ANY MORE] media company dedicated to the advancement of writers, announced today it is partnering with the leading [BIGGEST, NOT BEST] self-publishing company, Author Solutions, Inc., (ASI), to launch Abbott Press-a self-publishing division. Named in honor of Richard K. Abbott, the legendary Writer's Digest editor, Abbott Press is devoted to helping writers improve their work and realize their dreams of getting published [AND TO WIPE OUT ABBOTT'S COMPETITORS] . "In keeping with the mission of Writer's Digest, and in order to provide our consumers with the most complete information, inspiration, products and services to further their craft, we are proud to expand our portfolio to address a real desire of aspiring writers-to get published, be it by indie publishing [CUSTOMERS OF ABBOTT WILL NOT BE ENGAGED IN INDIE PUBLISHING] or by traditional means," said Sara Domville, president, F+W Media. "Fully supported by the trusted experts at Writer's Digest, Abbott Press brings the same respectability, integrity, and commitment to editorial excellence as our Writer's Digest brand, [WHICH MAY LOSE ITS INTEGRITY] while maintaining a unique identity of its own, for the benefit of our authors." Through this strategic partnership, Author Solutions will manage Abbott Press on behalf of Writer's Digest, taking responsibility for sales and publishing activities, while delivering a comprehensive array of publishing, marketing, and book-selling services, designed specifically for Abbott Press authors [ACTUALLY, THEY'RE PRETTY MUCH THE SAME AS THE SERVICES FROM OTHER ASI BRANDS]. The educational and editorial services provided to authors fall under the respected Writer's Digest brand umbrella of Writer's Digest Books, Writer's Digest University, The Writer's Digest Conference, and Writer's Market. "This is a landmark alliance, as Writer's Digest has been the relied-upon source for support and education for writers for more than 90 years. Its entry into the self-publishing arena further exemplifies the sea change toward indie publishing which puts the control squarely with the author," said Kevin Weiss, Author Solutions president and CEO. Author Solutions, Inc. is getting too damned big. More importantly, I don't like the idea of a magazine that carries advertising for competing self-publishing companies, to have a financial stake in the success of one of those companies. If you were a soda salesman and wanted your products to be sold by Walmart, would you expect to be treated fairly if Walmart owned Coke or Pepsi? If you were the boss of Infinity Publishing or Outskirts Press and you advertise in Writer's Digest, would you expect to be treated fairly -- in ad placement and editorial coverage -- if WD profits from the success of your biggest competitor? I'm sure that WD wants the world to believe that the new arrangement will have no effect on its relationships with the competitors of its own Abbott Press. But, in an era when print publications are starving -- and since WD is operated by human beings -- it will be extremely difficult for WD to resist the opportunity to maximize its income by discriminating against Abbott's competitors. WD may degenerate into a biased "house organ" for ASI. In the past, I got pissed off at WD for having Outskirts Press sponsor the annual WD Writing Competition, giving credibility and visibility to Outskirts at the expense of other publishing companies. It also bothered me that WD runs events and publishes books that compete with the services and products of its advertisers. The new deal seems much worse, and I'm very sorry to see it. When I was a journalism student we were taught that legitimate publications maintained a "Chinese Wall" between the editorial and advertising departments. Allegedly, at the New Yorker magazine, the ad people and the editorial people used separate elevators to minimize the chance -- or even the appearance -- of ad people pressuring the editorial people to tout the advertisers. On the other hand, we were taught that trade publications -- particularly those that were greatly dependent on ad revenue -- were whores who would do anything necessary to bring in the bucks. It appears that WD is transitioning from being a little whore to become a huge whore, with a pimp that wants to vaporize its competitors. It was just a matter of time. Publisher's Weekly has already gone over to the dark side. I didn't renew my subscription to Writer' Market this year-- I bought the Economist instead. It's more depressing, but at least there aren't any ads for vanity publishers! But, I do have to agree that Author Solutions has become the “Dark Side” of indie/self publishing. Unfortunately, Writers Digest (like many magazines) is just another terrified dinosaur trying to survive in the digital world. Many see no other way to survive, other than to step up there whore game. Thanks for bringing up your concerns. We're well aware of the dangers here, particularly given who we are. It's a scary line to be walking, particularly if we don't handle it properly. The site and the packages will be tweaked over the next few weeks. Our desire is to come up with something that helps writers improve their craft, not just get self published. So we'll be adding a lot more supplemental stuff to the more basic packages like those used by Thomas Nelson (West Bow Press), etc. We're looking at things like educational webinars, books, magazine subscriptions, etc. Even stuff that provides tips on getting published through traditional means. Whatever we can add that will help make each package worth the investment. We're also trying to ensure that certain standards are set in place re: who should self publish through Abbott. So, for example, if someone wanted to self publish with the expectation that they would get distribution across all of Barnes & Noble, it's required that we suggest he or she try a more traditional method of getting published. Honestly, I welcome constructive criticism. The last thing any of us want to do is screw up a 90 year old brand. Plus, we have a great relationship with the agent community, and can't afford to mess that up either. A few weeks before we went live I contacted some other prominent bloggers and industry watch dogs (Author Beware, etc), asking them to help us tweak the details as best we could so that we're not overpromising things and making it very clear what writers get for their money. In some cases, we're still awaiting feedback. In others, we're hoping to have some face to face meetings. I suspect we'll be adjusting the details for some time to come. Anyone should feel free to get in touch directly if they have questions or concerns. My email is phil.sexton@fwmedia.com. Bookmark's comment is a good one. It's absolutely true that publishers are looking for ways to supplement their more traditional income. There's no denying that. (Though WD is actually heavily entrenched in the digital world already. For the last few years we've been building a business model that would allow us to survive if print ever did go away.) The goal is to try and do so as righteously as possible. Sincerely, thanks for watching out for your fellow writers. Apologies, meant to say Writer Beware, not Author Beware. Phil, the general attitude towards self-publishing is indeed changing. The reputation of vanity printing has not, and that is the type of slime you just jumped into bed with. Why in the world would Writer's Beware even want to talk to you about it after hearing who you were partnering with? Look up the difference between true self-publishing and vanity publishing/printing. This is definitely not true self-publishing. As a former employee of the Empire (and a member of middle management privy to the inner workings of this cabal from the beginning of its inception) I can only say as bad as it looks from the outside, it's far worse on the inside. From purchasing a competitor in order to make use of their Phillipines sweatshop to the "pipeline" of work that requires employees to have a quota of work to produce daily based on minimums, to the abject lack of morale, to the outright fear of its Bloomington Indiana employees, to the substandard wages, ASI is a factory. Widgets are produced. Quality is unimportant. Churn is the word of the day. The Empire is real and Writers Digest should be well advised to be doing damage control. Hope the money's worth it, WD. You sold your soul.